I got back from a work trip on Saturday morning and after flying all night and enduring a three hour layover in Atlanta on no sleep, I finally made it home only to be sick the entire weekend with food poisoning. For someone who likes to cook and eat, food poisoning is brutal. I already had no food in my fridge because I was gone all week which is just as well because the only thing I’ve been willing to get down is water. I still haven’t been able to get to the store or think about food yet and am going on my third day of little to no food. But as I’m starting to feel a little bit better, I’m considering (maybe) a smoothie. This is reminding me of this Creamy, Dreamy Tropical Smoothie I made before I left on my work trip. When I was feeling 100%, this was a perfectly cool summertime treat for these dog days of summer. 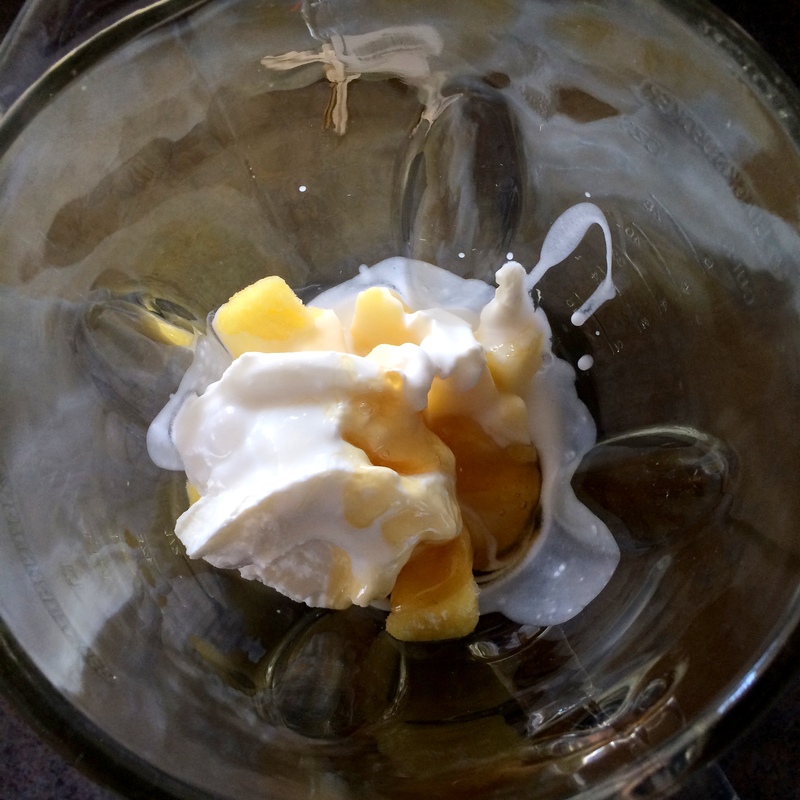 Frozen pineapple, Greek yogurt, coconut milk, and honey are blended together until smooth and creamy. 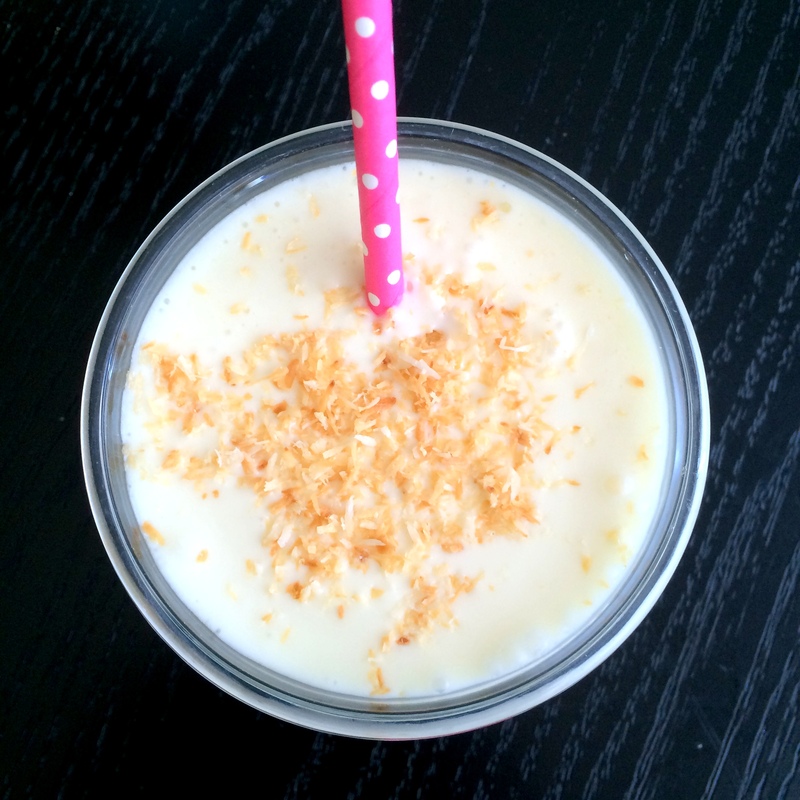 A little topping of toasted unsweetened coconut finishes off this smoothie which really is like a drinking a sip of the tropics. Since I used frozen pineapple, I didn’t use ice but if using fresh pineapple, you’ll need the ice to thicken it up. Thinking about this smoothie, I’m dreaming of the days when I will be lakeside next week listening to the waves instead of home laying in my bed under the weather. 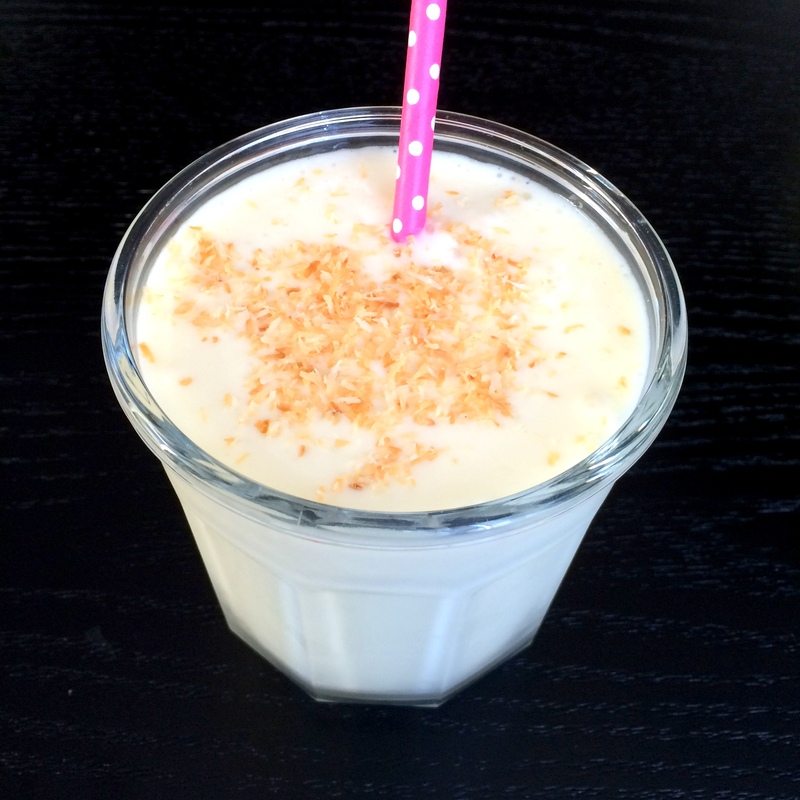 Place pineapple, yogurt, coconut milk, ice, and honey in a blender. Process on high speed for 60 seconds or until smooth or desired consistency. Pour into tall glasses. Garnish each serving with 1 teaspoon toasted shredded coconut, if desired. Serve smoothies immediately. 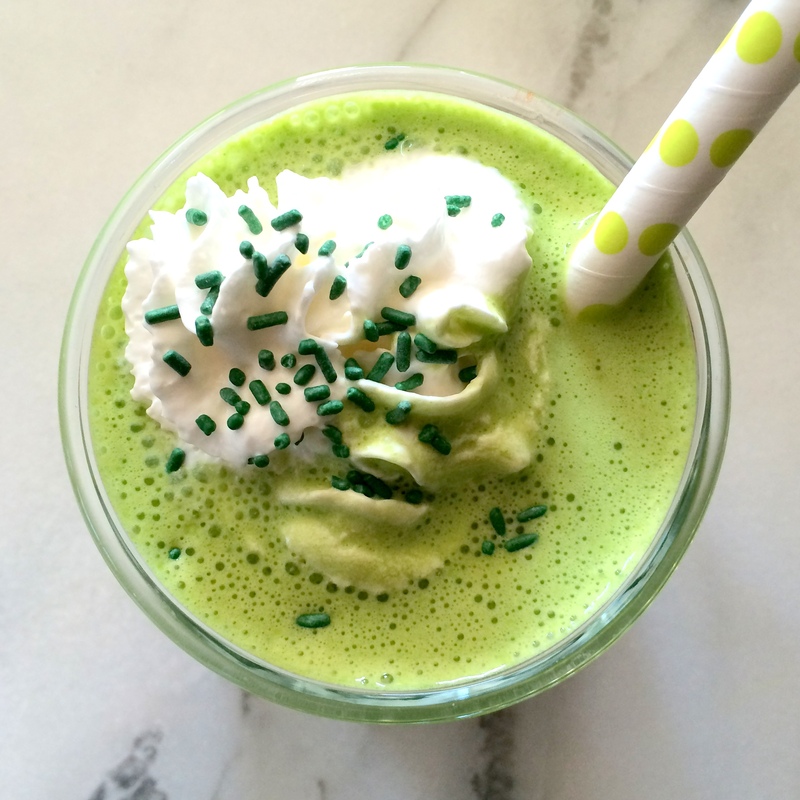 Does anyone else get nostalgic for minty shakes from their childhood around St. Patty’s Day? I hadn’t yet thought about it until I saw this Instagram photo from Food Network last week. 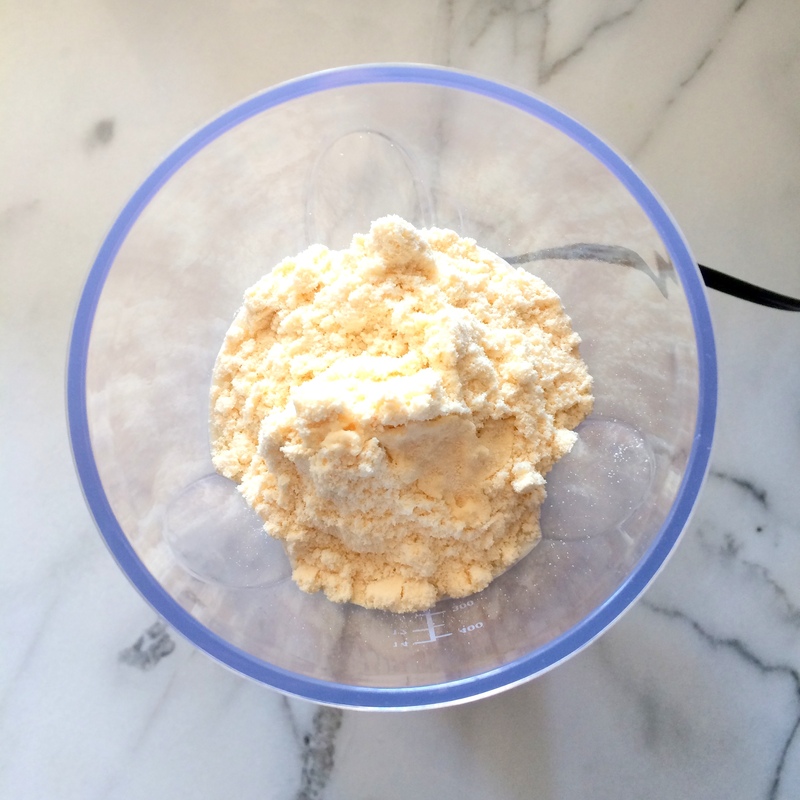 And just when I convinced myself that I was going to get ice cream to make the recipe in the photo, I decided that I could probably make a similar tasting shake in a much healthier way. 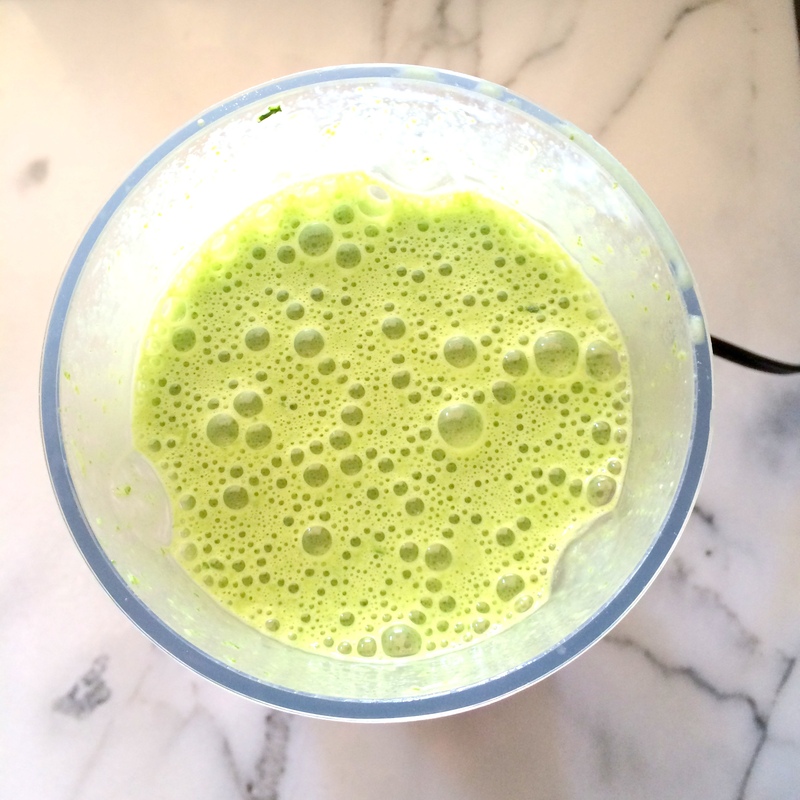 The result was this Vanilla-Spinach Shamrock Protein Shake. Almond milk, vanilla protein powder, spinach and peppermint extract are all combined in a blender resulting in a healthy, low-calorie, minty shake. The spinach provides a natural bright green color and the vanilla protein powder adds just enough sweetness to keep this shake just under 150 calories. 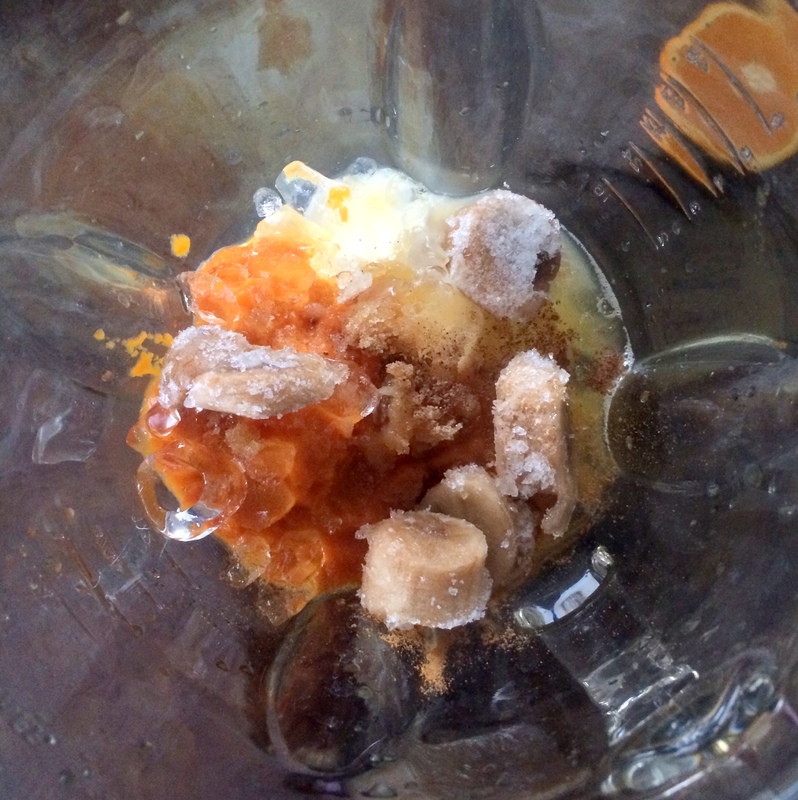 If you prefer a slightly thicker shake, just add some ice. 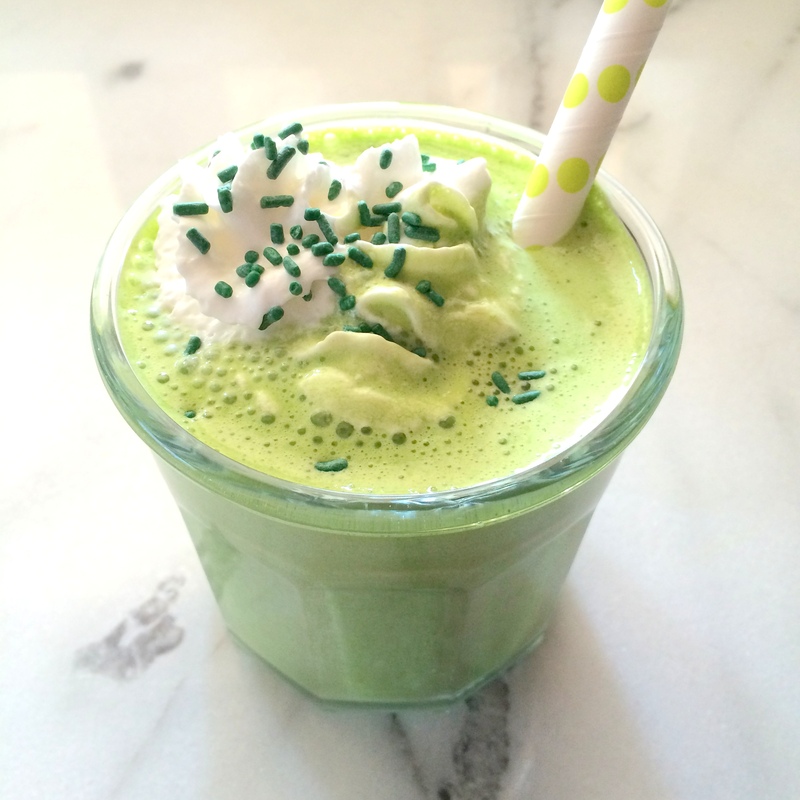 Whether you are watching your weight or not, this is one guilt-free way to celebrate St. Patty’s Day. 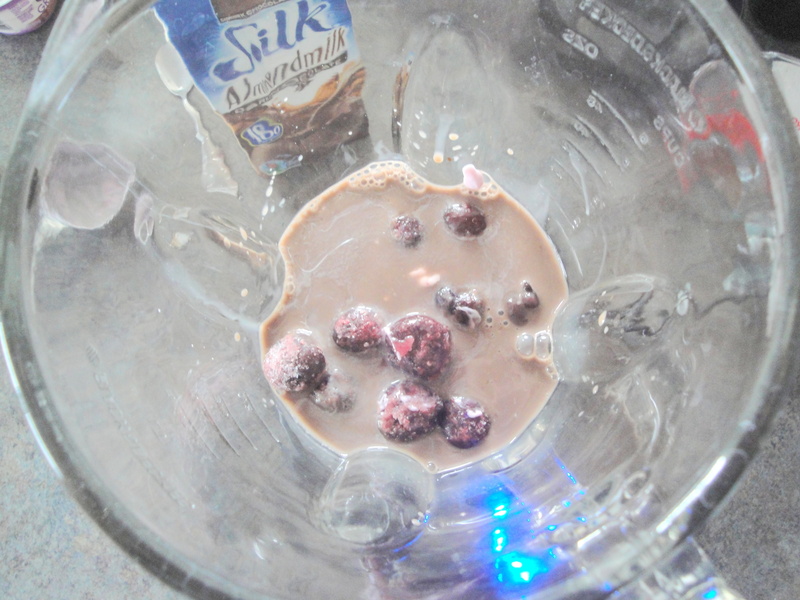 In the jar of a blender, combine almond milk, protein powder, and peppermint extract. 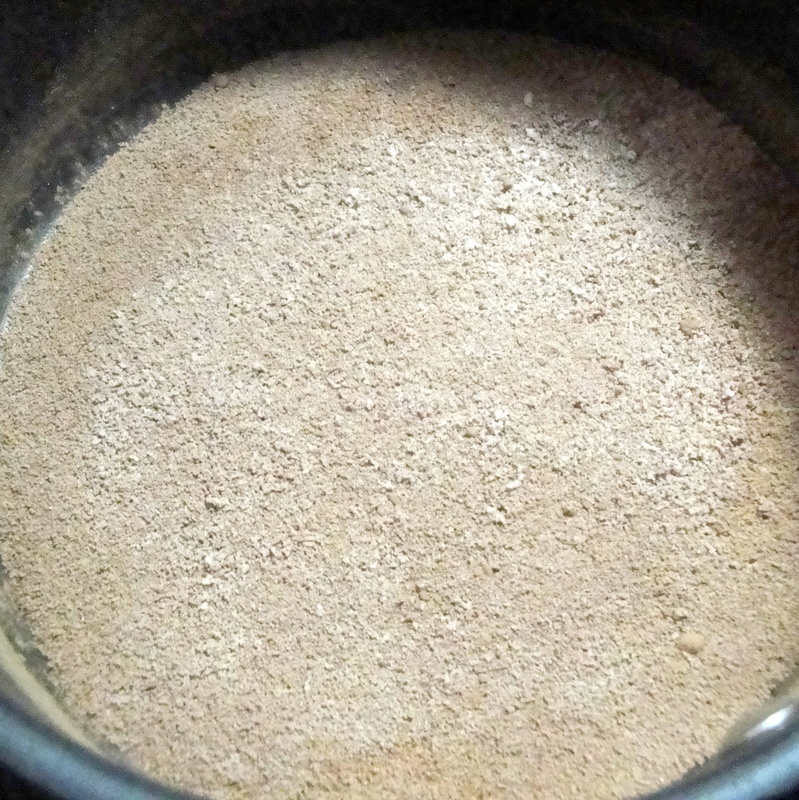 Blend until combined, about 10 seconds. Add spinach to the milk mixture, pressing lightly down into milk if need be. Blend for 30 seconds until spinach is thoroughly combined. 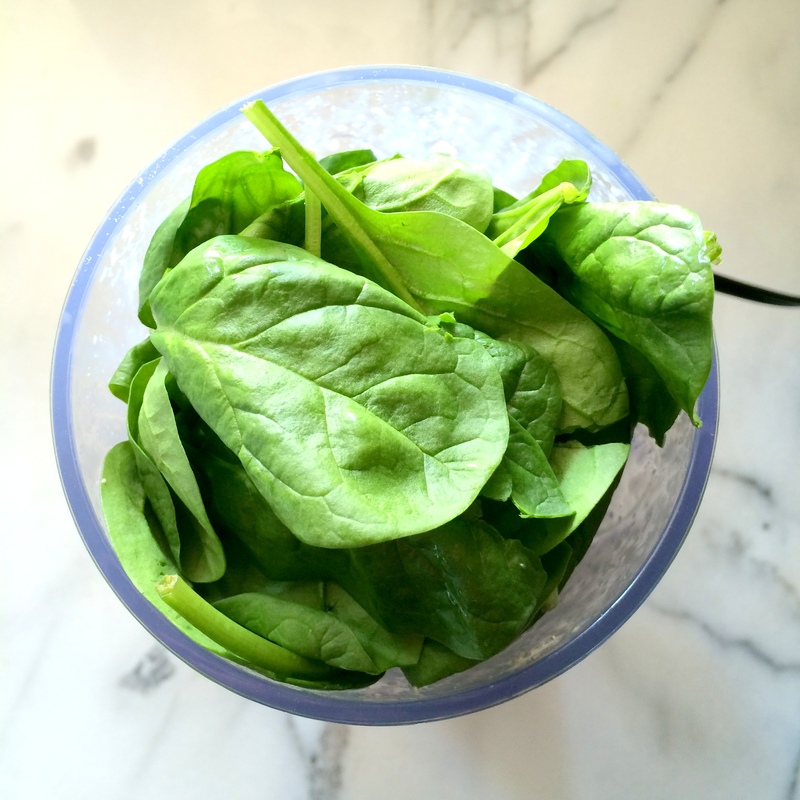 (If any spinach is left unblended, use a spoon to push it down into the jar further and blend a few seconds more.) Top with whipped cream and sprinkles, if desired. Did you do a lot of baking around the holiday and still have partial bags of chocolate chips laying around your cabinets? Well I do. What do you do with those leftover chips? Sure, I could combine them all into a fabulous mega-chip cookie but I’m a bit cookied out after the holiday and need a break from that. 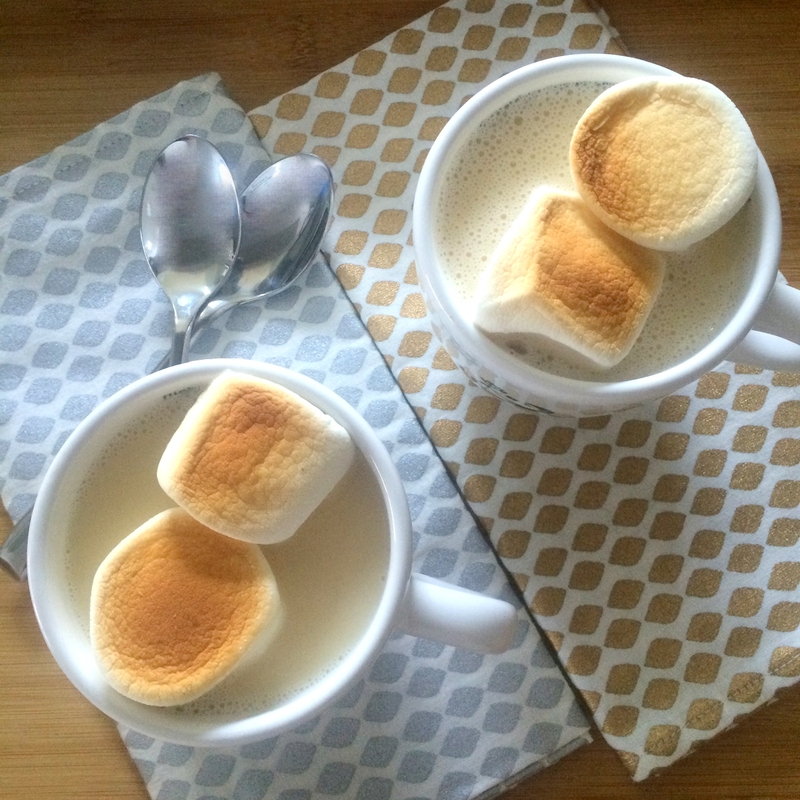 I’m not inclined to snack on white chocolate the way I might regular chocolate so when I came across this recipe for White Chocolate Mocha, it seemed like the most perfect way for me to a)use up those chips and b) warm up! White chocolate and milk are melted together with a little coffee, a tiny bit of rum, and a tinier bit of vanilla. The trivial amount of rum isn’t significant enough for me to consider this an alcoholic beverage and while you could leave it out, it adds yet another layer to this mocha that feels so deep and complex. I’m not usually the biggest of white chocolate fans. I mean, I like it but I’ll generally take any brown chocolate over white any day. But this! Oh my goodness! I can’t even begin to tell you how much I loved this. It was so boldly flavorful without being too sweet or too rich. The coffee flavor was just subtle enough to make this a mocha without making it overwhelming. This mocha was like getting a warm, sweet, childlike hug before bed. Please, if you have any white chocolate lingering in your cabinets, make this as soon as you can! 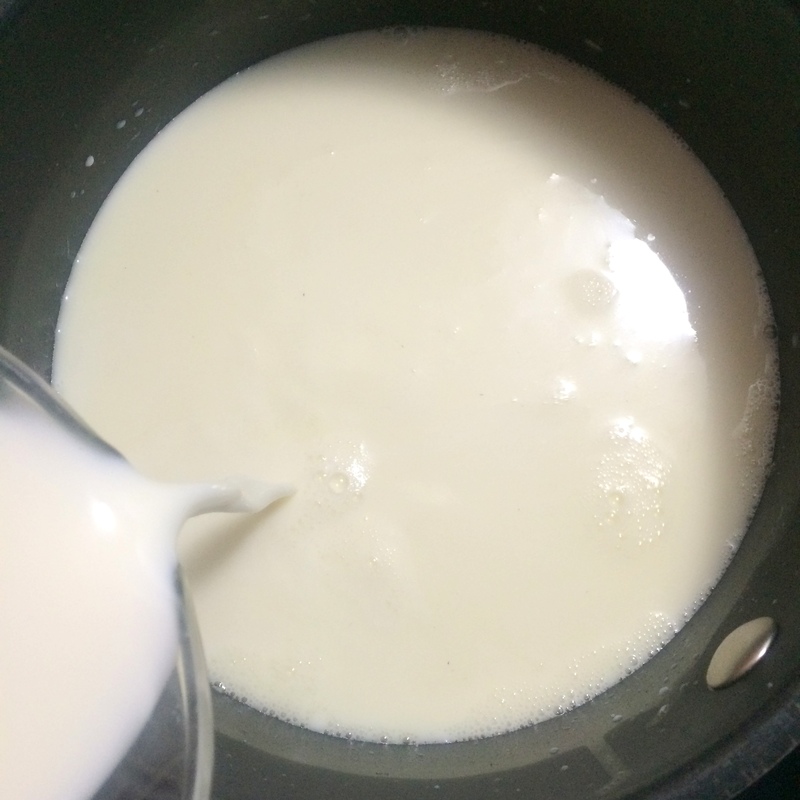 In a large heavy saucepan combine white chocolate and 2/3 cup of the milk. Cook and stir over medium-low heat until chocolate is melted. 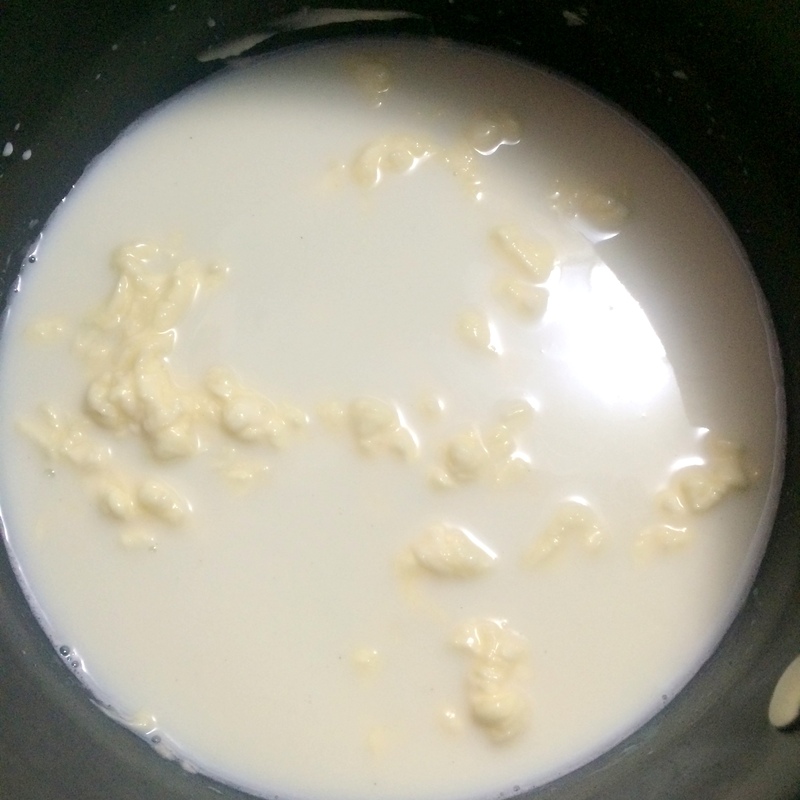 Add remaining milk. Cook and stir over medium heat until heated through. Stir in coffee, rum, and vanilla. 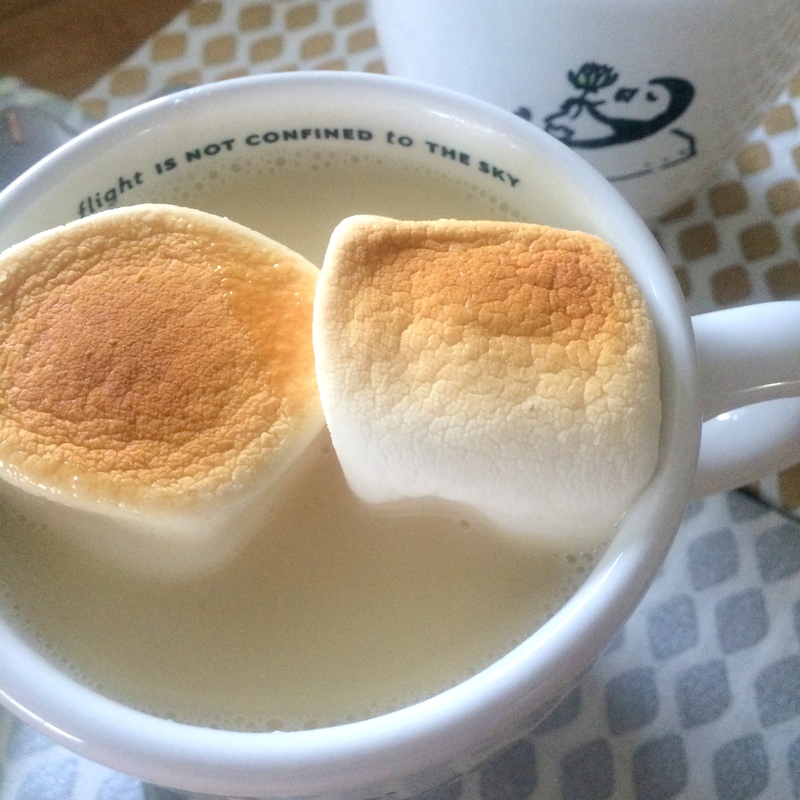 Serve in mugs topped with marshmallows. It really is kind of amazing how different your house can feel once you put up Christmas lights. So when you have the lights on and look out the window to see it is snowing delicately outside, doesn’t your mind instinctively develop a hot chocolate craving? Not to mention that it’s so cold out that sometimes you want to drink something other than coffee to warm you up. 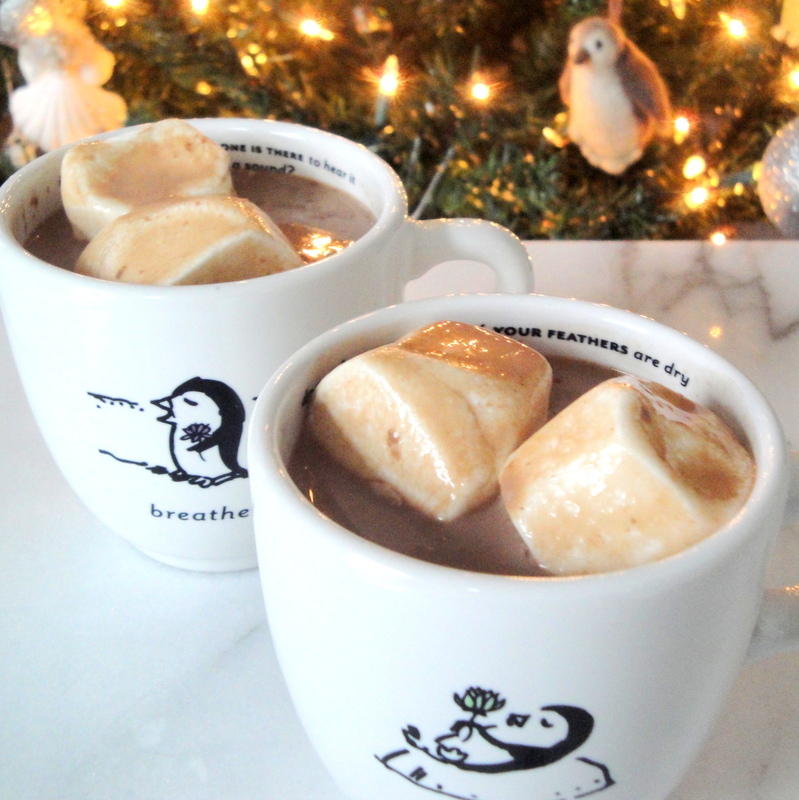 This Gingerbread Cocoa is warm cup of festive comfy goodness. 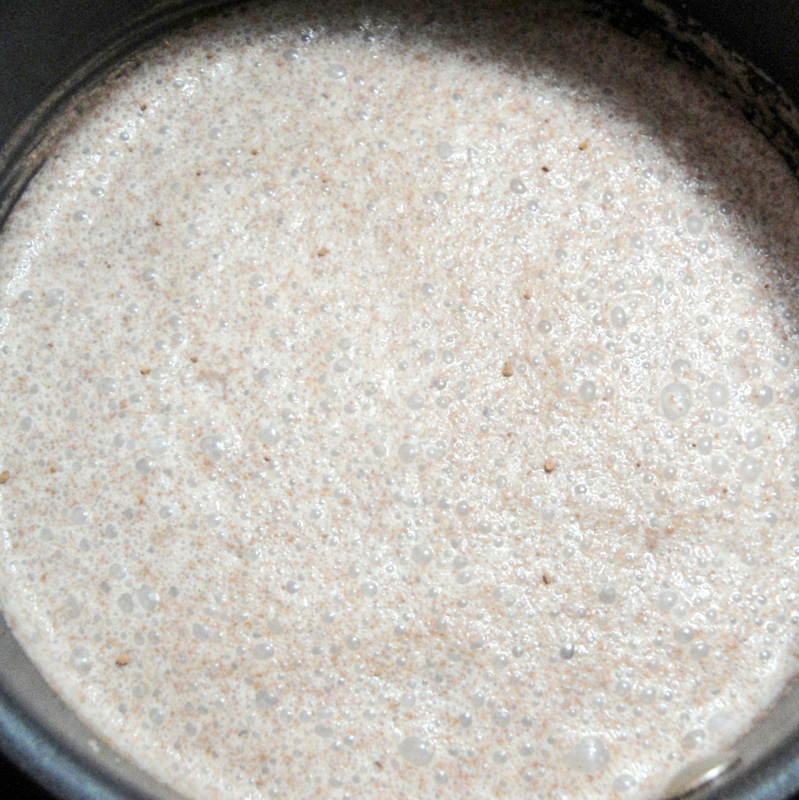 Cocoa, sugar, apple pie spice, and ground ginger are combined with milk and whisked together until warm and smooth. The cocoa and spices melt away and develop a warm, subtle spicy flavor that will make anyone wonder what’s in this milky cup. 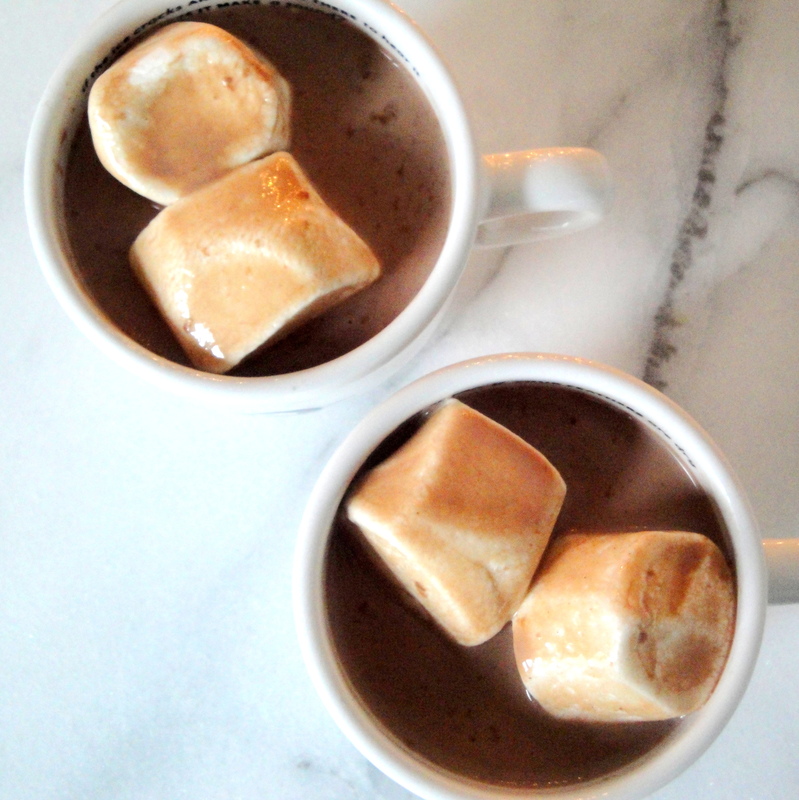 This recipe called for a gallon of milk which was a little more hot cocoa than I needed so I cut this recipe in half… and in half again. I also used unsweetened vanilla almond milk because I’m crushing on it lately and it’s what I had on hand. The result was a creamy, chocolate-y thing that makes you go hmm. And perfect for a snowy day. 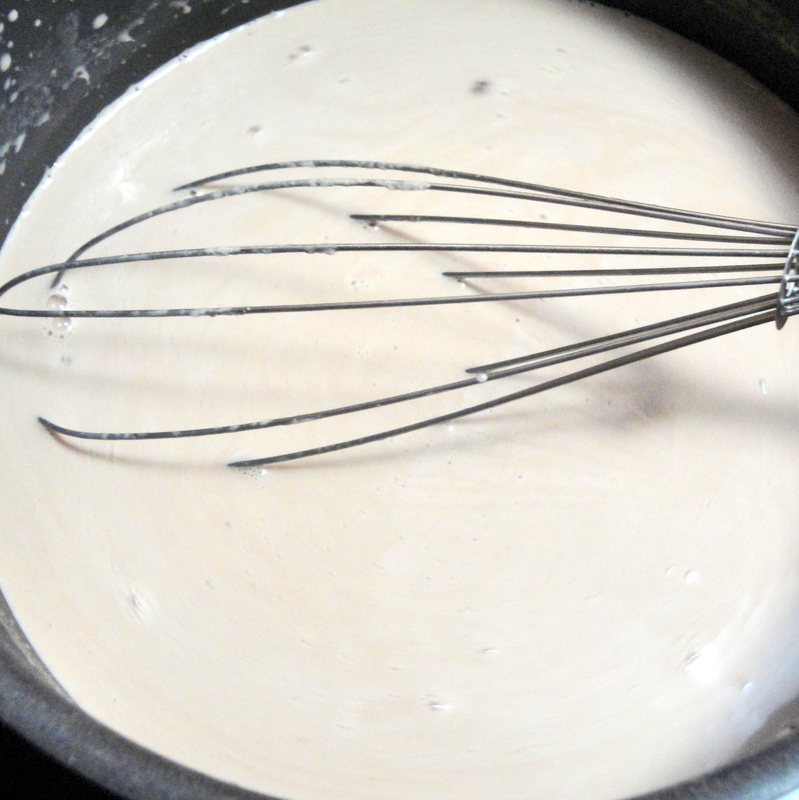 Whisk together first sugar, cocoa, apple pie spice, and ground ginger in a pot or Dutch oven until blended; gradually whisk in milk. 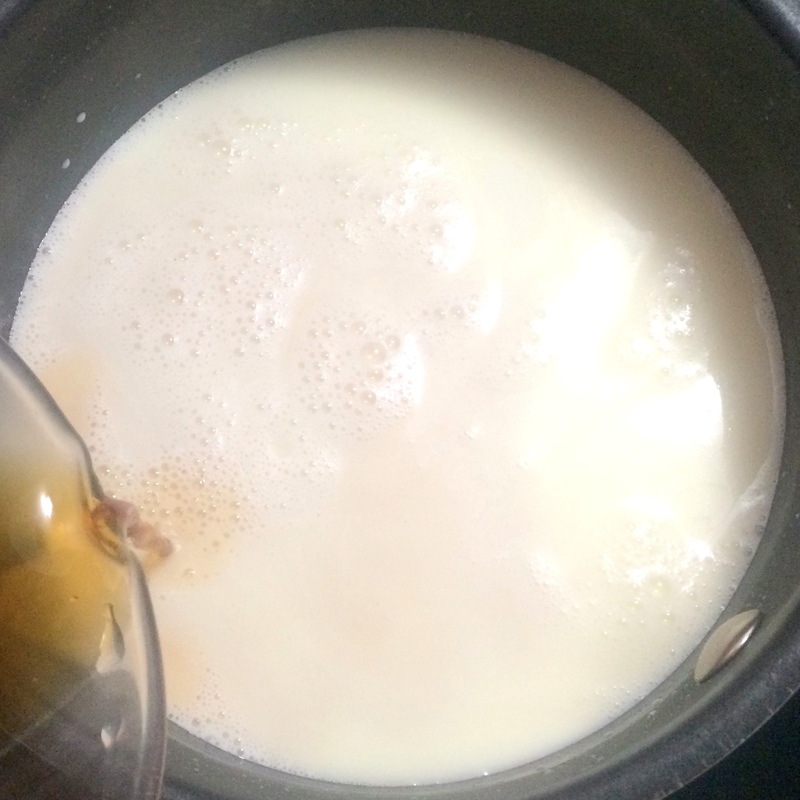 Cook mixture over medium heat, stirring constantly, 20 minutes or until thoroughly heated. Transfer to a slow cooker, and keep warm on LOW, if desired. Well, how was your Thanksgiving? Did you eat too much? Drink too much? I’m happy that I didn’t overstuff or overserve myself and today I feel really good! But despite all the good food I ate yesterday, I didn’t finish it all up with a healthy piece of dessert. So, when I woke up this morning craving something pumpkin, I looked in my refrigerator and decided that I could get some pumpkin dessert flavor for breakfast without a lot of ingredients or calories. 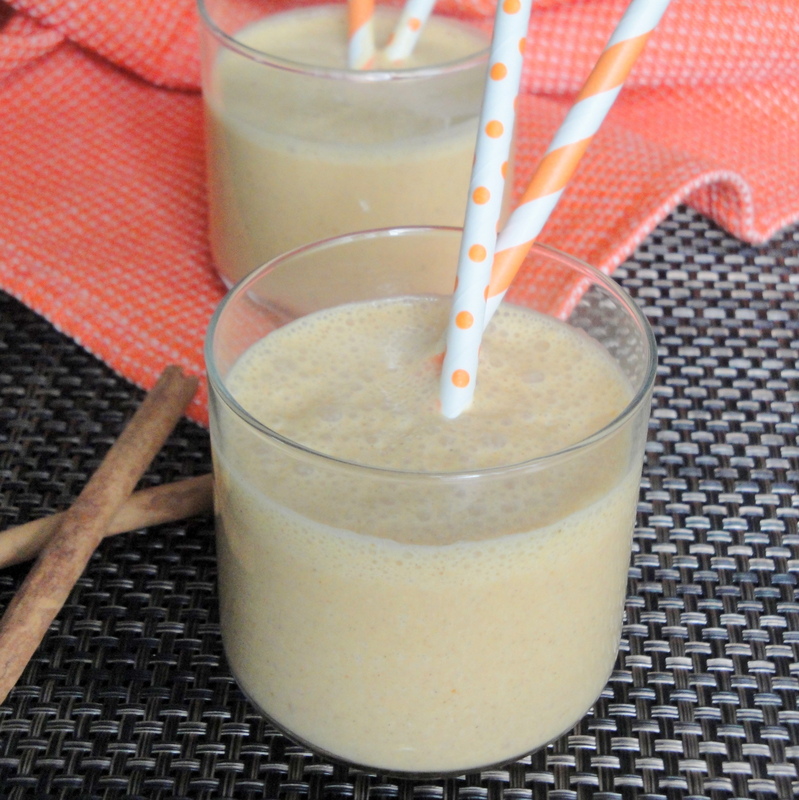 These Pumpkin Cheesecake Smoothies were just what I needed! 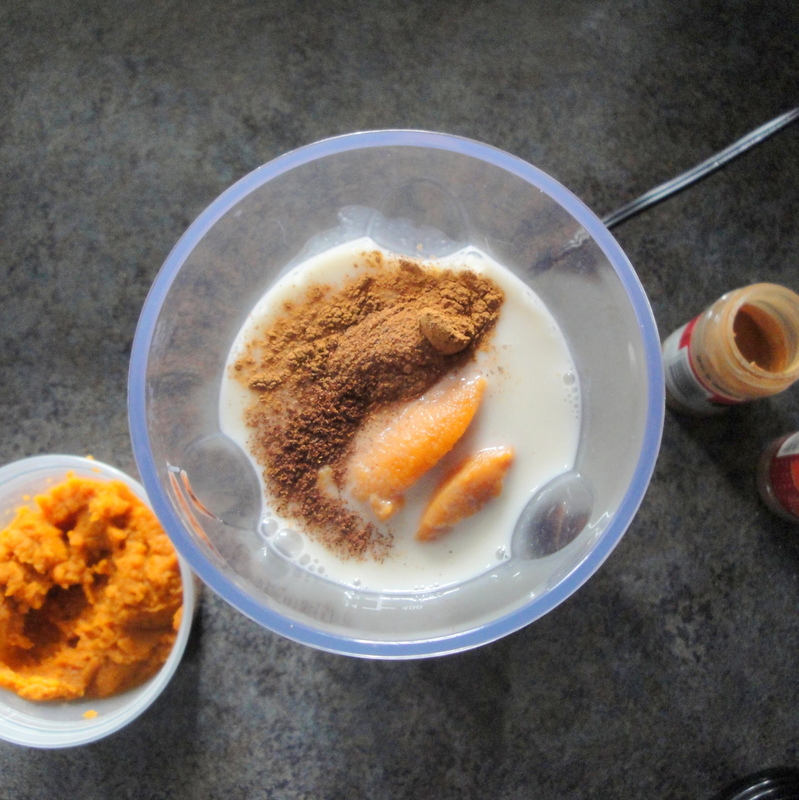 Pumpkin puree, almond milk, cream cheese, and spices are blended together with a little bit of sweetener making this pumpkin cheesecake in a glass. 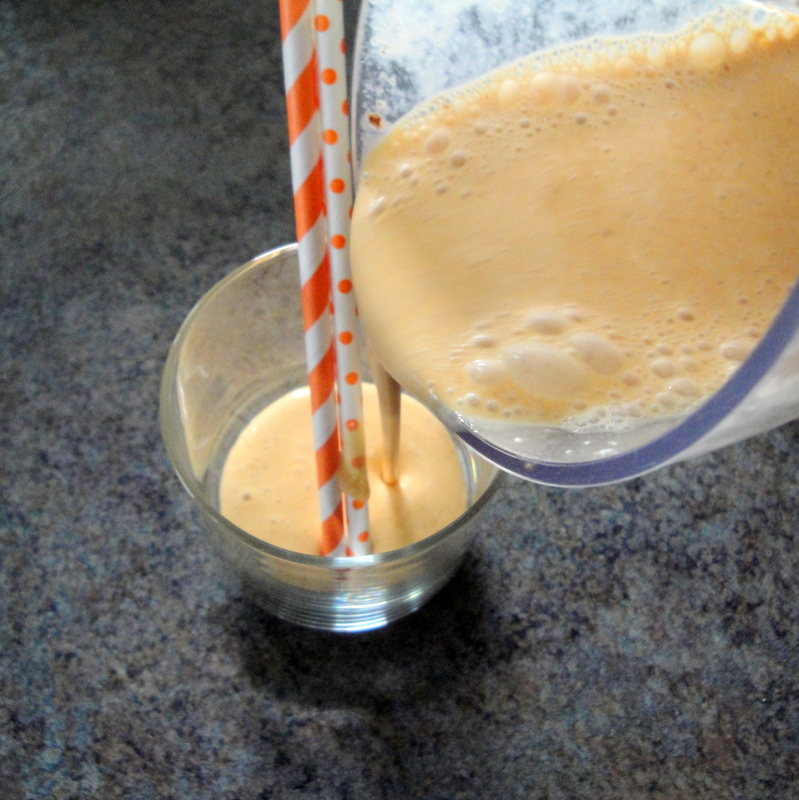 I love the flavor and creaminess of almond milk but you can use regular milk if you like. I also used a packet of Splenda but if you are a sugar person, go for it. Really, I was a little surprised just how well this turned out. Maybe I should have thought to do this last night after dinner? After all of the cheese and wine I consumed last week in Buenos Aires, I need to get it together. Quite frankly, I’m tired of chicken, have no desire for salads, and can’t eat any more eggs. When I get into an eating rut like this, where I want to eat healthy but can’t stand to eat the same old, same old, I like to replace a meal with a smoothie a few times a week. It’s the middle of October so it feels completely appropriate to break out the pumpkin. 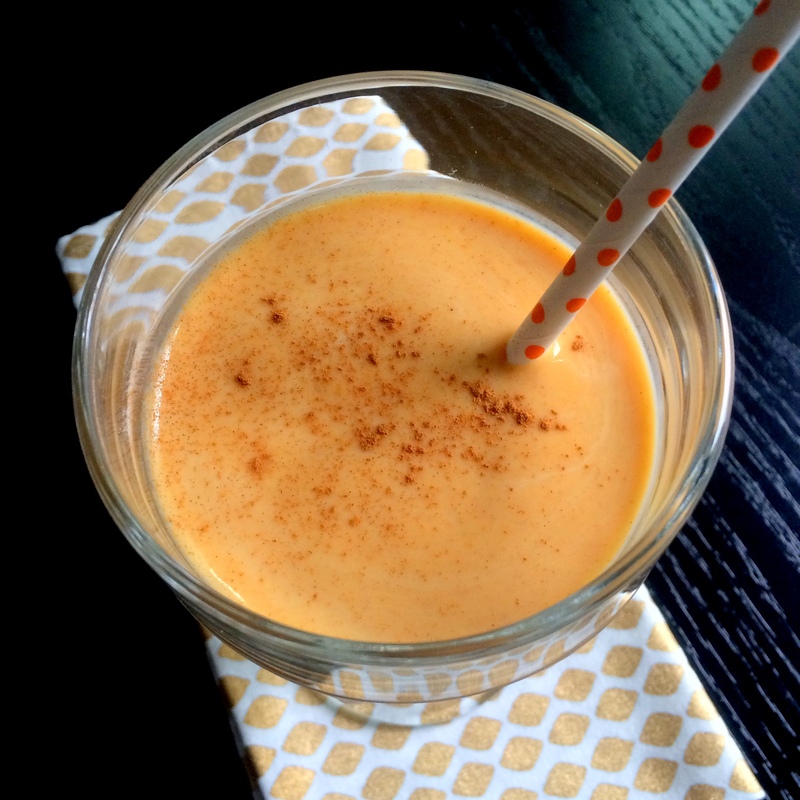 This Banana Pumpkin Smoothie is the perfect fall meal that tastes more like a treat and keeps my pants fitting. 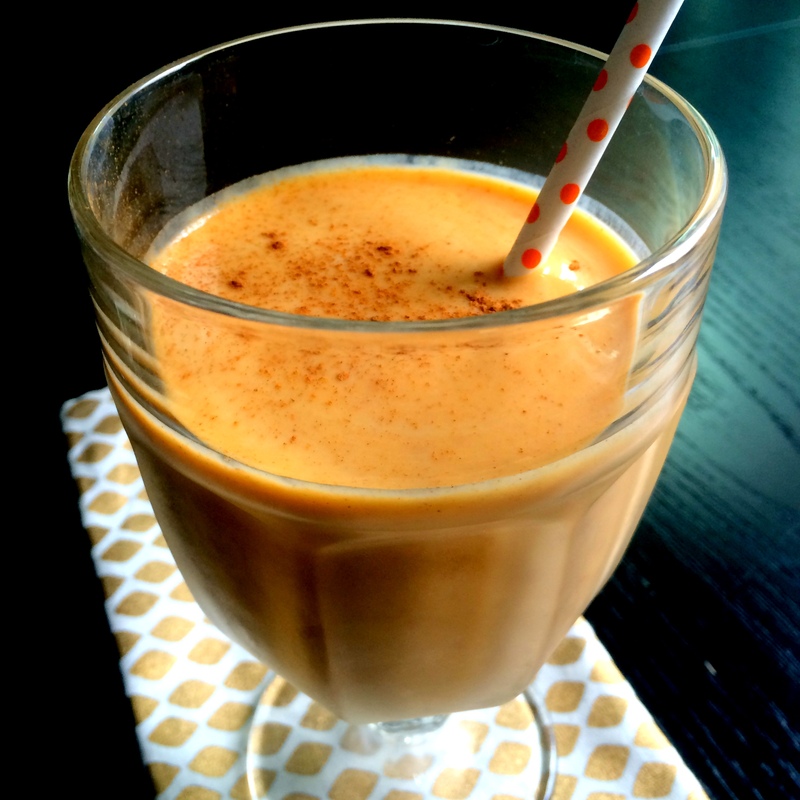 Vanilla yogurt, canned pumpkin, orange juice, and frozen banana are the basis of this smoothie which is jazzed up with warm spices and a hint of brown sugar. 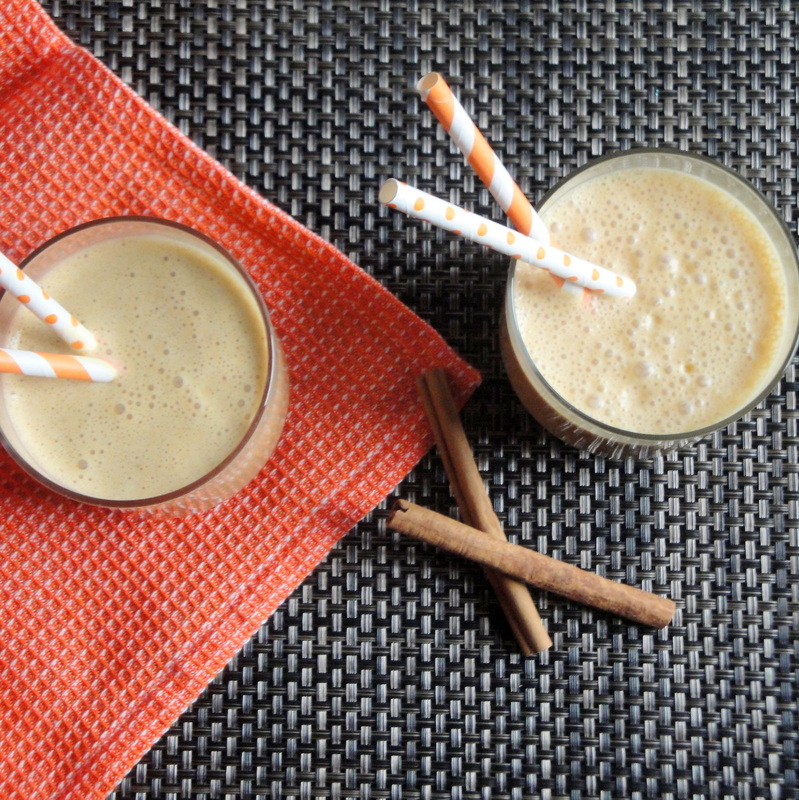 Right around now, you can find all kinds of recipes for pumpkin pie smoothies but what makes this one unique and different is the addition of the banana and fresh orange juice. I always have slices of frozen banana in my freezer just for smoothies like this but if you don’t, a fresh banana will work fine, you just may want to add extra ice. I never thought to combine orange and pumpkin together but the flavors marry perfectly, giving this drink a light freshness you don’t typically get with fall pumpkin flavors. I’m sold. 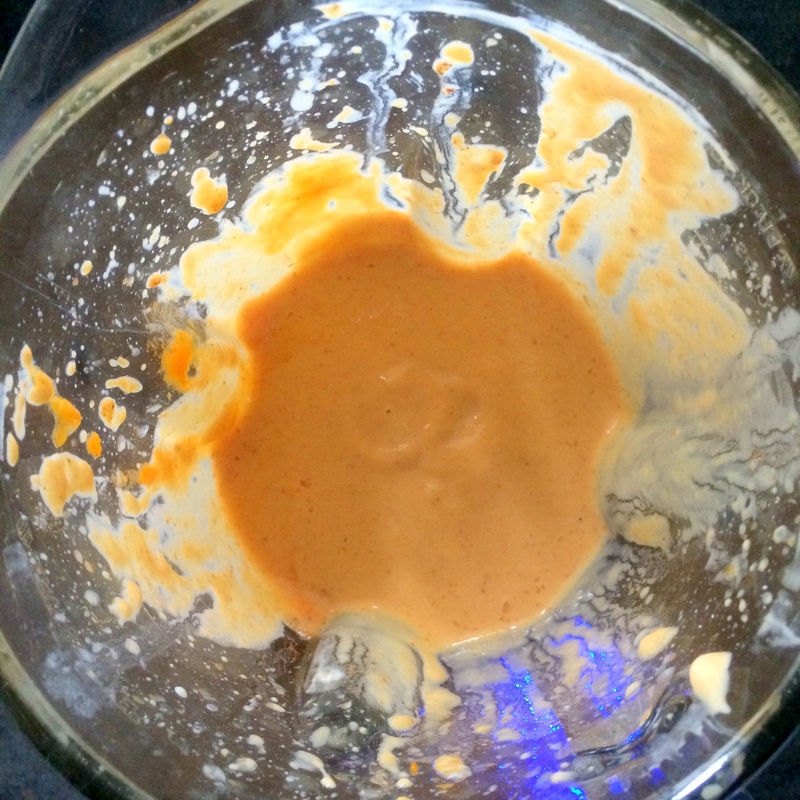 Combine yogurt, pumpkin, ice, orange juice, brown sugar, spices, and banana in a blender, and process until smooth. Garnish with dash of ground cinnamon, if desired. Serve immediately. Every once in a while I become obsessed with certain foods and eat them constantly. I’ve been through brownie batter fits, black bean burger rages and trail mix binges. Recently, I’ve been on an almond milk kick. I’m not really the biggest milk drinker in general and only have it in the house if a specific recipe calls for it or if I have a box of cereal. But lately, I’ve been drinking almond milk, both plain and chocolate, like it’s going out of style. I decided the chocolate almond milk was begging to be mixed with the bag of frozen cherries I’ve had in my freezer for a while now and despite the fact that I’m always cold and am still dealing with 11 inches of snow from the other day, I wanted to make a smoothie. 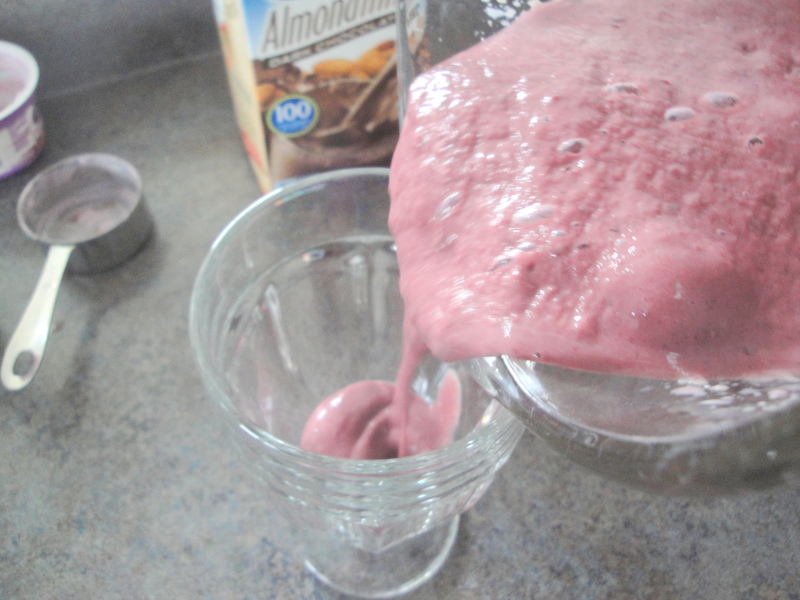 This Chocolate-Cherry-Almond Smoothie completely knocked my winter socks and slippers off. 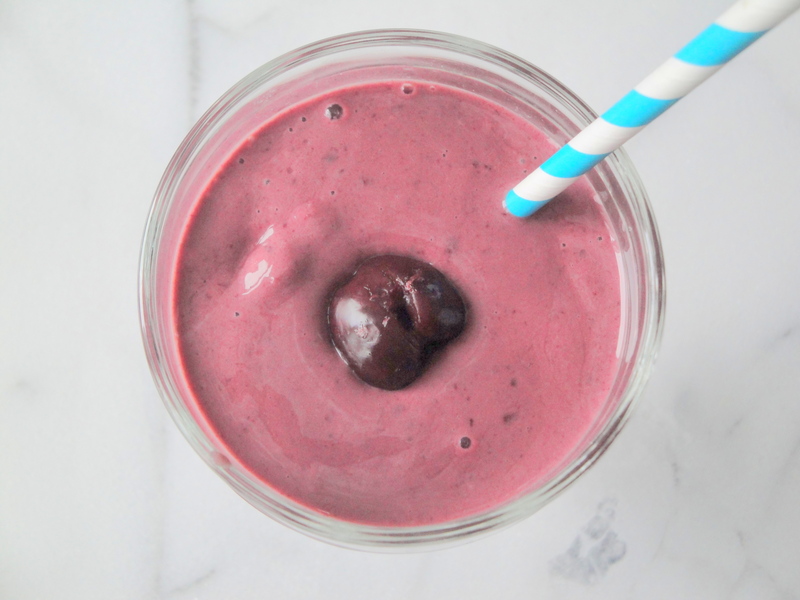 Cherry Greek yogurt, chocolate almond milk, frozen cherries, and a dash of almond extract are blended together until smooth making for a rich, sweet and satisfying smoothie. 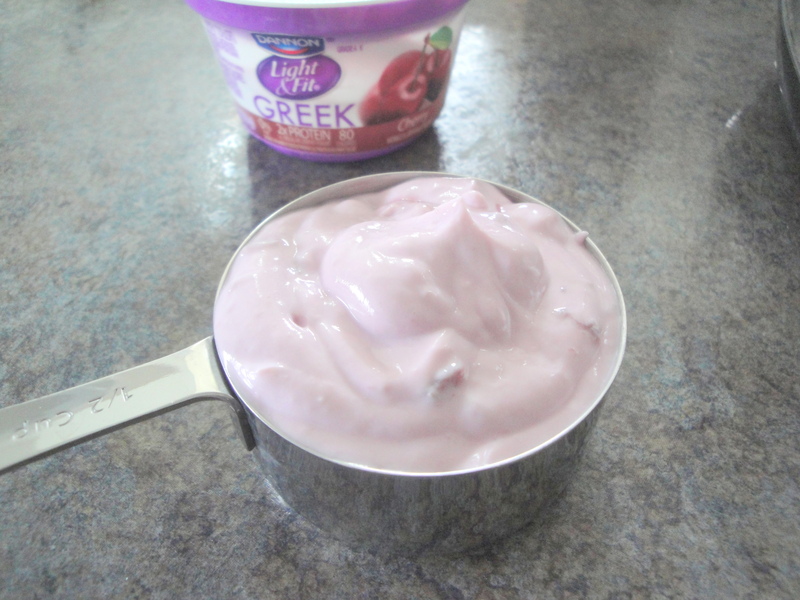 Regular milk and regular yogurt could be substituted here but I really love the thickness of the Greek yogurt and the added hint of flavor the almond milk provides. 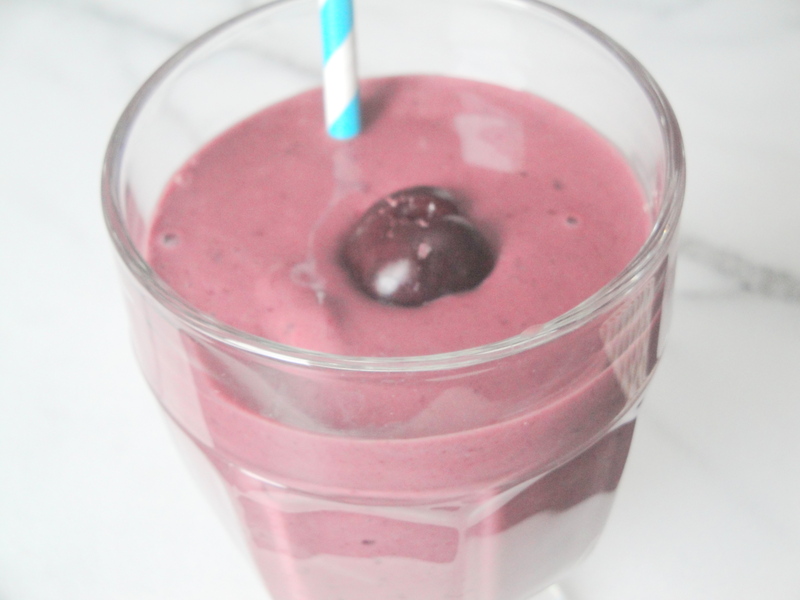 The chocolate almond milk adds just the right amount of chocolate which pairs so perfectly with the bright cherries. With 1 gram of fat and 14 grams of protein, this smoothie is perfect for breakfast, an after workout drink or satisfying enough for dessert. Combine all the ingredients into a blender and blend on high for 30 seconds. Add ice if necessary to reach your desired thickness. Top with a cherry and chocolate shavings (if desired).